Group Captain Mohonto Panging hails from Pasighat in Arunachal Pradesh and is a retired Fighter Pilot who has been decorated with the Presidential Award – the Vayu Sena Medal. He has the distinction of being the only person from North East India to Command a Sukhoi-30MKI Squadron. 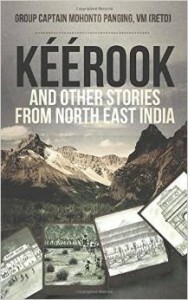 The ten tales in this collection center round the unique way of life, customs and traditions of people inhabiting the seven contiguous states in North east India, Assam Meghalaya, Nagaland, Mizoram, Manipur, Tripura and Arunachal Pradesh . Three stories Indi-Chini Bhai Bhai, Odyssey to Thoubal and Exodus to the North East are of special significance: people from the North East are discriminated against in the rest of the country. There have been incidents were they are mistaken as foreigners. That is the reason why an extract from book is part of the review. The stories present a perspective that should go a long way in removing the misconceptions of Indian from other parts of the country. ‘How can you call me a Pakistani…?’ the man thundered back. ‘How can you call me a Nepali…?’ Kabit replied. ‘You look like a Nepali…’ the man replied. ‘You also look like a Pakistani…’ Kabit stood his ground. ‘Don’t call me a Pakistani…’ the man charged. ‘You don’t call me a Nepali…I am an Indian…the same country as yours…’ Kabit replied and walked off. On one occasion some main land officials cast aspersions on the citizenship of north easterners. Khotuo Chaya from Kohima and Noune Zhotso from Pipema in Nagaland applied for passports at Bengaluru. After an inordinate delay, the regional passport officer called them to the passport office. ‘Where were you born?’ the Passport Officer asked Khotuo and Noune. ‘Where were your parents born?’ the Passport Officer continued asking. ‘Both in Kohima’ Khotuo replied. ‘My father in Pipema and mother was born in Zakhama’ Noune replied. ‘Where are these places?’ the Passport Officer continued asking. ‘All these places are in Nagaland’ Khotuo replied for both of them. Khotuo and Noune were flabbergasted at the question asked by the passport officer. ‘Yes…Are you citizens of India?’ the passport officer continued. ‘Sir, all our documents have been submitted to you. These include our birth certificates, schooling certificates, college certificates, tribe certificate etc. We belong to Nagaland. Nagaland is a full fledged State of the Indian Union. How can you have doubts on our citizenship…?’ Khotuo was almost shouting. ‘That’s all okay…please submit an affidavit declaring that you are citizens of India…!’ the passport officer was relentless. ‘Sir, What is the proof of your citizenship?…How do you prove that you are an Indian citizen and we are not? You mean to say that you are more Indian than us…just because we belong to north east India!…we are not going to give you affidavits to prove our Indianness…if you do not issue our passports on this ground, we will resort to other legal means…!’ Khotuo replied……..
During the NCC Republic Day Camp held at Delhi Dorothy Lyngdoh, Tombisena Devi and Asen Jamir along with few more girl cadets from the north east contingent went through a harrowing experience at India Gate. The girl cadets were strolling near India Gate when a group of men started following them. ‘Hey Chinky…hello Chinky…’ one of the men shouted at them. The girls ignored the group of men. ‘Mera naam ching ching chu, ching ching chu…’ one of the men sang aloud. The girls ignored the group of men and walked away. ‘Sayonara, sayonara…hey ching ching chu…’ the men kept following them. The girls ignored the comments and walked away increasing their pace. ‘Mera joota hai Japani, yeh patlung chinesetani…’ the men continued their teasing. Dorothy could not take it anymore. ‘Wah wah…ching ching chu hindi bola…kya chikni maal hain…’ the men continued their harassment. ‘Chikni Chinky…Chikni Chinky…Chikni Chinky…’ the men shouted at them. The girls faced them and Dorothy replied ‘Please bhaiya, we are also Indians…we are not foreigners…please leave us alone’. Luckily for the girl cadets, some more cadets from other mainland contingents were present in the same area. The cadets from other mainland contingents recognized them as fellow cadets and rescued them before the group of men could touch them. Shocked and traumatized the girl cadets returned back to their camp.